Home Uncategorized Everything you need to know about Chatbots. According to Wikipedia, A chatbot is a computer program or an artificial intelligence which conducts a conversation via auditory or textual methods. The term “ChatterBot” was originally coined by Michael Mauldin, the creator of the first Verbot, Julia in 1994 to describe these conversational programs. We can consider the chatbot as an intelligent when it becomes able to understand the user’s needs and handle any kind of conversation. It could have NLP (Natural Language Processing) which scans specific keywords from the user’s input and send a predefined answer, stored in the database. You might ask, which big brands use Chatbots, so here is the list. StarbucksYou can find Starbucks’ chatbot inside the Starbucks app. Starbucks makes it easy to order over voice command or text messaging. The chatbot also let you know about Order Status and Total Cost. 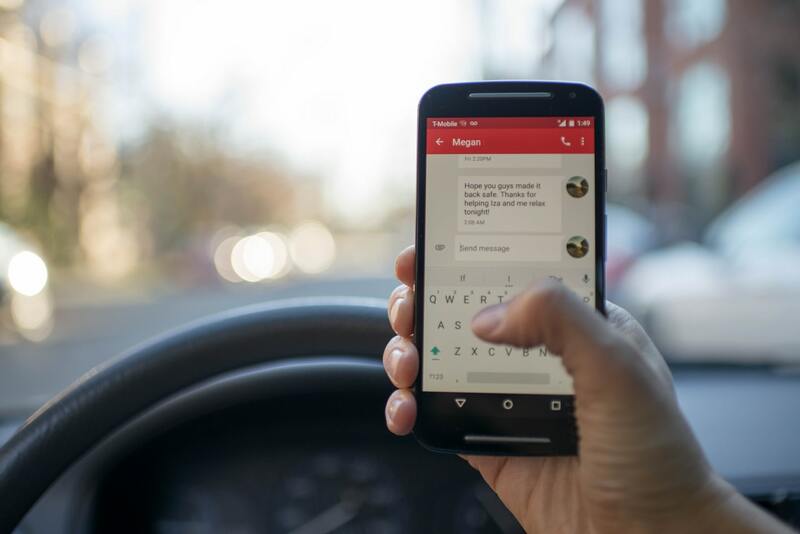 LyftLyft’s chatbot is available on Facebook Messenger & Slack. You can request a drive from Chatbot as well. In facebook messenger bot you can know the current location of the driver, License plate, and car model. SpotifySpotify’s messenger bot allows to search, listen and share music. It also sends playlist based on your mood. MastercardMastercard’s messenger chatbot enables their customers to check their transactions. With Masterpass they can from MasterCard partners like FreshDirect, Subway, and the Cheesecake Factory. Pizza HutPizza Hut’s customers now directly order from Facebook Messenger or Twitter Chatbot. Customers can also ask questions. Over the last 50+ years, the chatbot has significantly evolved, After 2016, many companies showed their interest in building Chatbot platforms. According to Business Insider’s survey, 80% of companies would like to deploy a bot by 2020 to improve the customer experience. Today, Chatbots are used by almost every industries including small. Medium and Multinationals. “Order Now” Option within Chatbot. 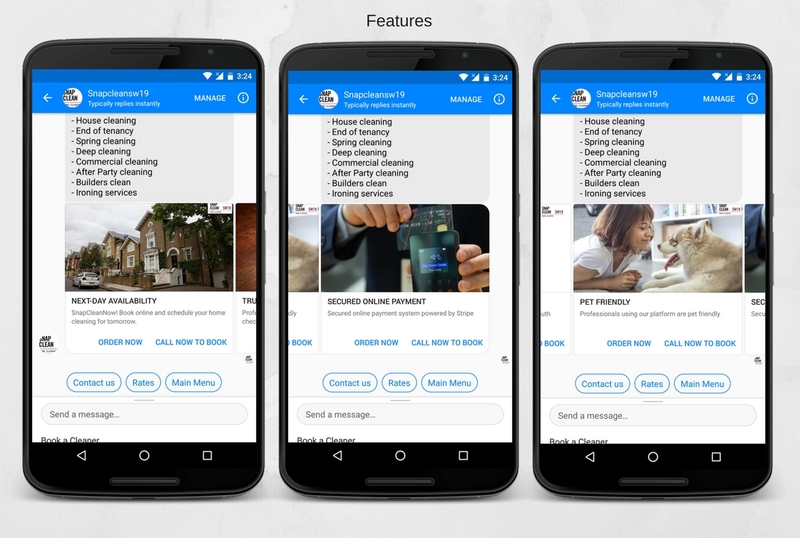 SnapCleanSW19’s Facebook Messenger Chatbot is made using the Chatfuel Platform. Customers can know about our services whenever they want, and that’s what our customers love. Chatbot can work as a customer representative who responds immediately and most importantly, it works 24 x 7. 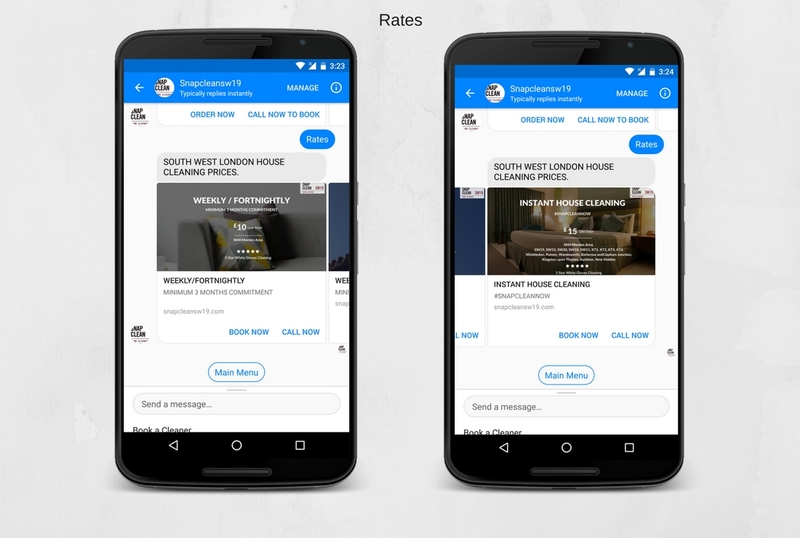 How Do Chatbots Increase Engagement in Digital Marketing? Social media isn’t just about connecting with friends and family anymore, It keeps evolving, Social Media Marketing is one of rapidly growing digital marketing service with lots of specification, tools, and ways to achieve the target. In the past two years, many tech companies have shown an interest in providing Chatbot support in their services. In March 2016 Microsoft Introduced Bot Framework. 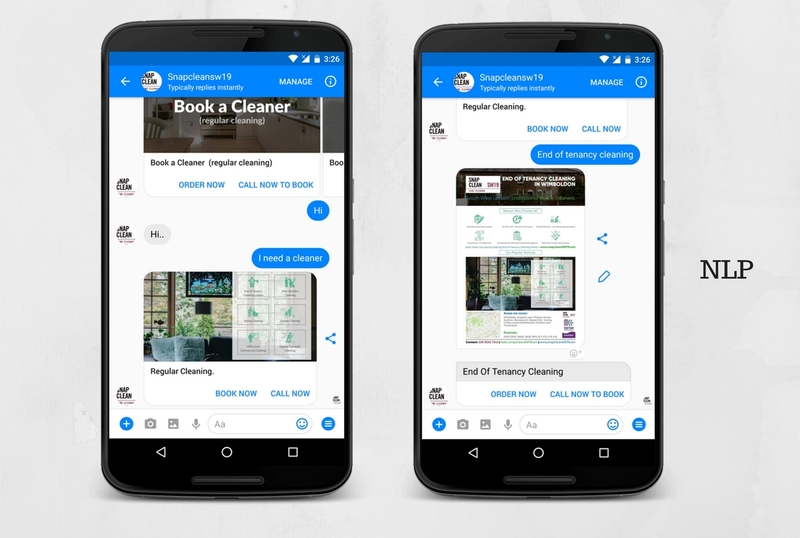 In April 2016, Facebook introduced their support for bots in the Facebook Messenger. People love to spend their time on Messaging Apps rather than emails. Even, people are spending more time on Messaging App than Social Media Networks. Chatbots can take user experience to the next level. People can know about your business or services whenever they want, and that’s what audience love. It empowers the customers. Chatbot can work as a representative who responds immediately and works 24 x 7. Chatbot can even do almost all things which are normal Apps do, In fact it improves the overall user experience. It’s built in a cloud and the most important thing is API is always available, continuously upgraded, and auto-scales to meet the needs. 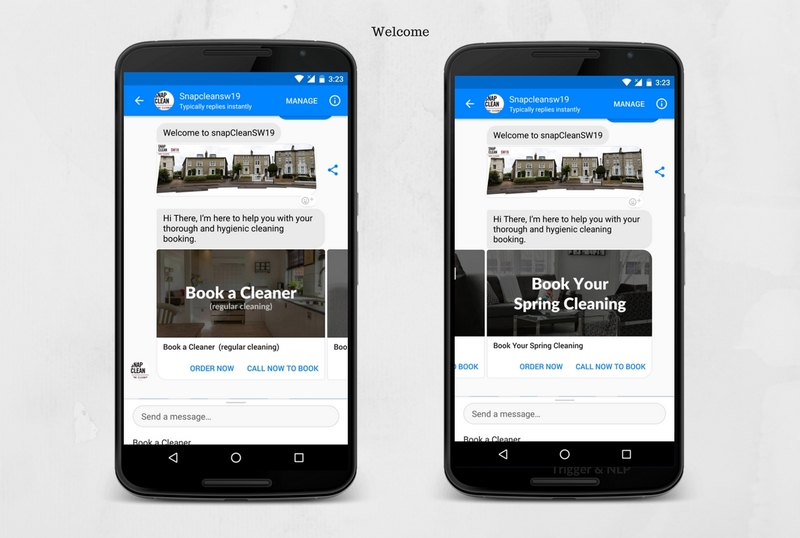 Chatbot isn’t just helping us to take user experience to the next level, It also helps to generate more leads, better website conversation rates, and business automation. Chatbots will change the way we do business, It will automate the task and Improve the overall productivity. Previous articleWhat is a cloud communication?